I was actually contemplating NOT doing this project this year because I was starting to feel overwhelmed by the other garden chores and projects, plus I have been discouraged for the past couple of years that they are not coming back to my garden in the numbers they used to. I did find a large-ish caterpillar a few days ago -- I thought it was about 3rd instar, and I couldn't leave it out there among all the predators/Garden Patrol. Where there is one... So I looked around but couldn't find even one more. This morning, however, the caterpillar I thought was only a 3rd instar, 4th at most, had turned into a chrysalis. Either I'm out of practice, or else it being so early in the season, this one is not destined for diapose and migration so it's a smaller specimen. ...and there was a female fluttering around, though this may be the same one as yesterday. She was looking pretty tattered, though still nervous and would not let me take a photo. I'm trying to focus on the Monarchs again, here in the MidSouth. As it happens, I'm talking about monarchs, life cycle, pollinators, plants etc (especially pertaining to our urban yards) in a couple of weeks at a garden club -neighborhood near me. Time to pull together info, resources and all that! From my experience, comments at the farmers market, checking lists from butterfly counts in W Tennessee etc, few monarchs are around before mid August. Mid Aug-Sept is when we see activity, and signs of the migrants headed south. Curious that we see few in the northern migration. In checking Journey North and other resources, the butterflies funnel up through TX, especially Austin area, most head north into the midwest and some on to Canada. Some go E from TX then up the eastern states, literally bypassing Arkansas, W TN and more. One can't blame lack of spring sightings on lack of habitat around here. Aside from yard plantings, there are numerous wildlife areas in the region and more. Later this month a woman from Monarch Joint Venture (MN based) is giving a workshop and talk. If I don't get to the workshop will go to the talk. Perhaps some light will be shed on all of this. Wow I'll have to try to read that tomorrow when I'm not so sleepy. But you present a dilemma. There's no way as many caterpillars will survive to become butterflies in my garden if I don't bring them inside to rear in protected environment, because I have a fairly full complement of Garden Patrol creatures outside. Even when I'm a little late finding them until later instars -- I had some devastating losses from 3rd instars on up when tacnid flies oozed out of them when they were 5th instars and nearly ready to turn into chrysalises. Oh my! Looks like several things going on here, as expected. I read through the Xerces org report. They are not fond of the commercially raised butterfly cats. One can buy the cats, or chilled butterflies for release (weddings, parties). Common sense tells us that is a prime way for pathogens to set in and spread. Picking off the eggs/cats from one's yard plants is a bit different. I haven't started on the swallowtails, but think it's time. It looks like a number aren't making it to full maturity and going into their next stage. Getting a few monarch eggs/cats, rearing and releasing will be in my plan, if and when! As mentioned above, I am signed up for the workshop that is part of Monarch Joint Venture, U of MN. This is the Monarch Larva Monitoring Project, citizen science. There are a couple of sites I get in the inbox, and good for those of us East of the Rockies, and interested in the monarchs. Monarch Butterfly Garden is in MN. It's one fellow, I think, sending e-notes on the monarch raising. Texas Butterfly Ranch. I like this one, in Austin (?) TX. Most of our monarchs funnel through that area, and they usually have good info and links. Monarch Joint Venture. Just signed in. Journey North . This has the maps and monarch sightings. I'm not fond of commercially raised and shipped and released elsewhere butterflies myself. Any time you mass raise then transport any animal (or even plants) you open a window for disease to be introduced. And I've raised caterpillars myself, one year on a large scale with over 100 caterpillars all in their individual containers. I know the dilemma surrounding them. I've watched the ever vigilant wasps clean them off the milkweed plants. I've seen those flies change a lovely chrysalis into a brown/green oozing mass. And I question some of the research. 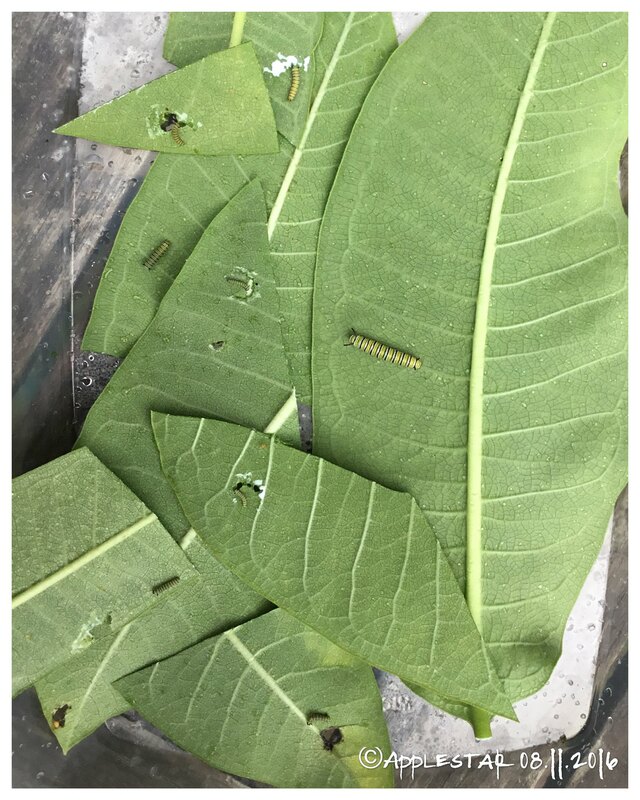 I agree that collecting and raising your own caterpillars is quite a different story than going into the field then transporting those caterpillars who knows how far to some lab then releasing them from the lab area. I haven't raised my own the past few years because work interfered and I've seen my visitor numbers dwindle down to near zero this year. Is it the weather? Is it the number of predators? Is it overwintering habitat loss? I wish I had the answers. I intend to raise more if I find the eggs or larvae. Last year I bought one of those mesh tube butterfly habitat houses. I just haven't had the time to check my milkweed plants. And meanwhile I keep looking at the research. This article from Discover brings up some of the concerns about even small numbers of caterpillars reared in captivity. 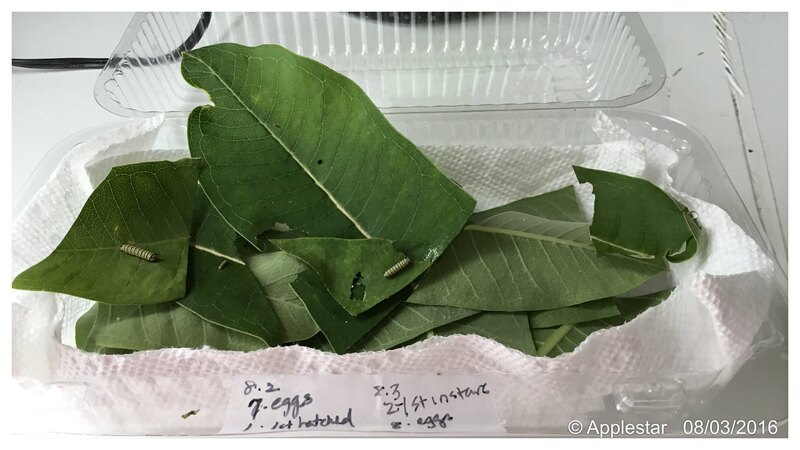 They talk about temperatures, lighting, and milkweed quality preventing the caterpillars from getting their environmental cues to prepare to migrate and delay their life cycle. I have considered building a Monarch house. It would consist of some sort of framework with fabric netting or screen over the frame which could be set over a potted milkweed plant. If the "roof" is also the same sort of screen material then the caterpillars would have the exposure to the natural temperatures and lighting. The main difference is that the caterpillars would be protected from young birds and hungry wasps. It would have to have a door or a flap for easy watering of the plants and to release the mature butterflies. Also it would have to allow for close monitoring of the population. Interesting discussion and comments, BL. Thank you! You had about 100? Yikes! As indicated my experience in the past couple of years limited, and plan to keep it that way. I'm using the mesh pop up laundry hamper. Last year added a mesh small pet carrier and can zip closed. This good as when the cats get ready to move on, they MOVE! I did just order a cat raising cage, and presume mesh with zippers. In this discussion figured time to do something about the swallowtail cats. I had seen a couple of smaller ones. Well, notice a number but think they are something's lunch before reaching maturity. I got one of the qt size parsley pots to put in the hamper, on a saucer over paper toweling. There was a mid sized cat already on it chomping away! Then found a couple more smaller ones on parsley leaves. To augment the one growing pot, harvested a few stalks to put in small vase (inkwell), and kept stumbling on more cats! I think there are 7 now in the hamper. Hampers/cages kept outside, sheltered so they have real air and light, but sheltered from hot direct sun and heavy rain. In a couple of days will move a couple of the larger ones to the totally zip up pet carrier. No monarchs sighted yet, spare one last month. I'm glad most of the issues and criticism have to do with commercial use of Monarchs for festivities rather than the citizen efforts to save them. When I was releasing them with children, I was so careful to protect the butterflies and demonstration caterpillars from mis- and over-handling. The children understood that it was a rare privilege to participate and be a part of the start of their long and rigorous migration. I'm happy to be among caring folks who are making an effort to help keep this and other species going. 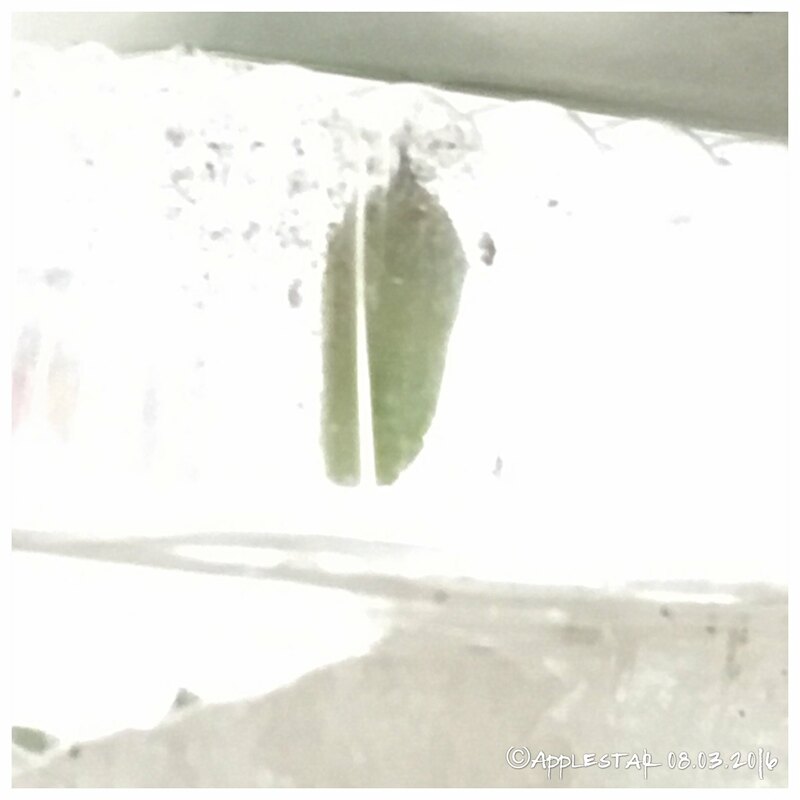 ...that said, I'm embarrassed to report that the first one eclosed before I was completely set up and relocate the chrysalis to a proper eclosure cage At least my instincts were spot on and I securely stood the container on its end for sufficient wing-room last night, just in case. It's a small female. I will release her or move her to a larger holding cage (yep pop up laundry hampers are great) before she gets too active. -- I found three 5th and one 4th instar caterpillars on a couple of milkweeds outside by the pond . 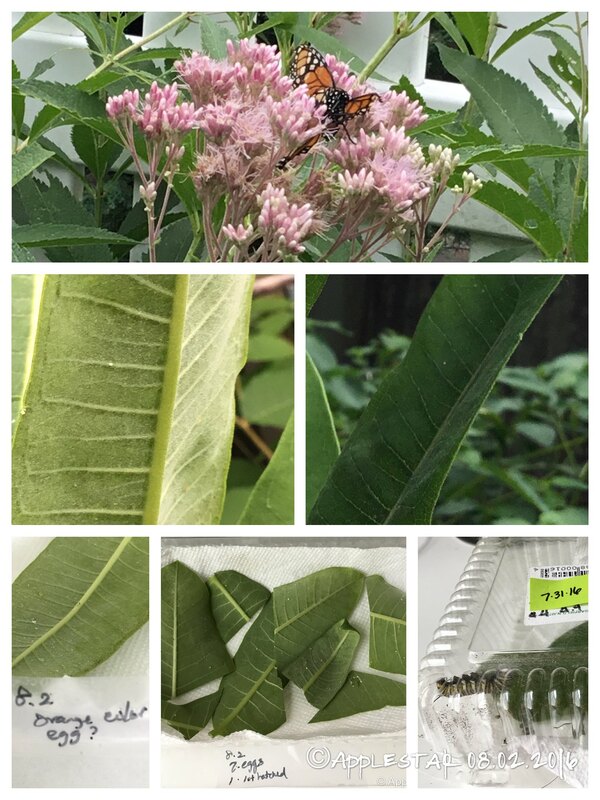 (Milkweeds that I have been avoiding approaching so as not to disturb the frogs and the tadpoles too much ) I didn't get the chance to bring them in yesterday and I'm not sure if I will at this point -- so often they are already parasitized by the awful tachnid fly. SusanW do you make efforts to protect the chrysalis you find? I might do that if they have already changed by the time I get back to them. New hatchlings are so tiny I can hardly see them unless I'm up close, but they can be found by looking for newly chewed through small hole in a leaf. If the hole is still oozing white sap, the babies are typically somewhere nearby. ButterflyLady29 wrote: I haven't raised my own the past few years because work interfered and I've seen my visitor numbers dwindle down to near zero this year. Is it the weather? Is it the number of predators? Is it overwintering habitat loss? I wish I had the answers. I intend to raise more if I find the eggs or larvae. Last year I bought one of those mesh tube butterfly habitat houses. I just haven't had the time to check my milkweed plants. When we started several years ago, every year, the number of Monarchs returning to our garden and eggs and caterpillars we found increased exponentially. I don't know what makes them come back here -- I don't know if the answers have been discovered. But, each year, we released roughly double the numbers from previous year. ... until the disaster at the wintering grounds in Mexico. "MY group" probably divides into two groups -- ones that head west and follow the inland corridor to the Texas funnel, and ones that fly the coastal route, flying down to Cape May and over the Delaware Bay, on down to Florida, then split again into subgroups that fly along the Gulf coast to Texas and some that winter in Florida (and maybe some that actually fly across the Gulf Of Mexico). My layperson thinking is that the population that instinctively returned to our garden was one of the severely affected casualties -- It would make sense that they wintered in close approximation to each other. And it has taken this long for the survivors to increase in numbers again. SO, I think you will have more visitors returning if you resume raising and releasing them again. ButterflyLady29 wrote: And meanwhile I keep looking at the research. This article from Discover brings up some of the concerns about even small numbers of caterpillars reared in captivity. We have a 2-person pop up mesh tent and also have used a pop up beach cabana when we had so many to release at once and were releasing them with children. This allowed them to enter the "butterfly tent" and for a time, feed the butterflies with pre-flight ration of nectaring flowers they picked as well as cotton swabs dipped in melon flavored Gatorade that was the recommended supplemental food. I have extra large pop-up laundry hampers as well as smaller hampers and a couple of those zip-top butterfly raising cages. But if you are handy and good seamstress, I'm sure you could build customized protective enclosures that fit your needs perfectly. I'm not sure I entirely agree about environmental skewing of their instincts since here at least, there have always been wild stragglers that migrate through or eclosed in the garden close to first frost. Once cooler weather arrive with early fall, ones that are raised and eclose in the house stay warmer than the outside night temps which would slow their development down -- I don't believe they mature faster in cooler temps. ...Light quality -- I suppose it could be different if they are bring raised in an enclosed space with no natural light -- I always set them up by the southeast window where they get filtered sun. Most of the later fall ones have been huge migration-ready specimens. ...milkweed quality... Hm. I haven't run out of my own supply since the first year. I intentionally feed them yellowed common milkweed as well as fresher ones from protected microclimates, and other milkweed leaves including honeyvine which remain greenest and freshest until frost. Yes, over 100. My daughter and I spent hours every day cleaning containers, checking caterpillars and feeding them. We ordered tags and tagged quite a few. I don't know if they made it to Mexico or not. The paperwork ended up in her homeschool file and was lost in the house somewhere before the next spring. I haven't seen those kinds of numbers since. Part of it is my fault. I limed the back yard and my previous stand of 6 foot tall milkweed (over 50 plants) never came back. I have some plants in the front yard and had 18 eclose on the same day last year. But I've seen only 2 butterflies here all summer, one a few days ago. The latest sighting was a male so no eggs from him. The large numbers were kept in a shed with skylights, windows, and where the door was left open most of the time. Other years I've kept them in the north window in the kitchen. Oooh. What a bummer about your milkweed stand. I didn't know they are sensitive to lime. Well, I hope you'll get your chance. I think there's still time -- here, August is prime month. They will continue to lay eggs until it's too late -- as late as 3rd week of September. I found these babies this morning... But I decided not to TRY to find every single one like I have before. I was saying exactly this to myself, and that I don't really want to feel overwhelmed, turning it into a chore... And looked up to see a female Monarch laying eggs. tags -- I'm thinking I might not tag them this year. That is another, significant and time consuming task, including keeping track of which ones eclosed first, wing-dried, and are ready to be tagged, plus when I tag them, I feel compelled to take photos of each one before releasing, adding on yet another step. I haven't checked the maps or the relevant forums and discussion groups at all this year, but it just occurred to me -- I wonder if the severe cold temperatures that dipped along the central states this spring are affecting the Monarch numbers and arrival time? I believe we had relatively milder temperatures in comparison here. There's a lot of environmental info you record too if you go through Project Monarch Watch. Temperature, sunny or cloudy, wind, etc for the date you tag the butterflies. At least it was on the sheet when we did our project. Also, we learned that if the newly hatched caterpillar doesn't eat it's entire egg shell it doesn't survive to become a butterfly. And that those parasitic flies lay eggs inside the caterpillars when they are very small. I had records of every caterpillar of when it was collected, what instar it was in, when it shed it's skin, and a lot of other info. Each was in an individually numbered container. A lot more work than most people would do but it was our little project. Toward the end of the season we kept a group in an aquarium. We were getting tired of recording the info but I don't think you could ever get tired of witnessing the transformation of caterpillar to chrysalis and chrysalis to butterfly. And then comes that oh so dramatic moment of watching your butterfly take it's first flight! And yes, the pictures! I think I used 5 rolls of film (36 exposures) on that project. Of course some were of my daughter holding newly emerged butterflies. It was a wonderful and memorable summer. I checked a few plants yesterday. Nothing. Well, there are Milkweed tussock moth caterpillars, Milkweed bugs, Milkweed beetles, various bees, Cabbage butterflies, and a few flies hanging around there. But no signs of any Monarchs. Seriously, hats off to you and your daughter for doing the individual container rearing. I just couldn't. In my garden, milkweed tussock moth caterpillars emerge just before the Monarch arrival. I try to get rid of of them as soon as they hatch when they are all still on the same leaf, but of course sometimes that's not possible. If I don't catch them in time, they can denude the entire plant -- I think I found that out 2nd year. I caught them early this year and spotted and eliminated at least 4 lower leaf hatchlings and caught up with a mob of them on two or three plants which I took care of by wrapping the entire plant in a big clothing store shopping bag and shaking them off. I found a few stragglers that had managed to escape my carnage later on. I think that was earlier in July. So at this time, I haven't seen any tussock moth caterpillars... except one younger instar that I saw very recently and eliminated from the blackberry -- I have no clue where it had come from since as far as I know there are no milkweed in that area. Do you suppose the fact that you are seeing some still means Monarchs will come along later?